There is a name for the bone weary exhaustion I feel most days & I cannot tell you how comforted I am by this knowledge. It’s called neurofatigue. On the most basic level, I knew what the symptoms were because I feel them almost daily. There are a lot of days when I feel like all the energy I have for that day is used up in a couple of hours. There are days when I have no idea how I’m going to get through another conversation. There are days when I don’t want to get out of bed & it’s not fair that I have to because I’m so so so tired & please just let me sleep a little longer. Please? There are days when I need to take a nap before I can have one more conversation with someone. Sometimes those days happen all in the same day. 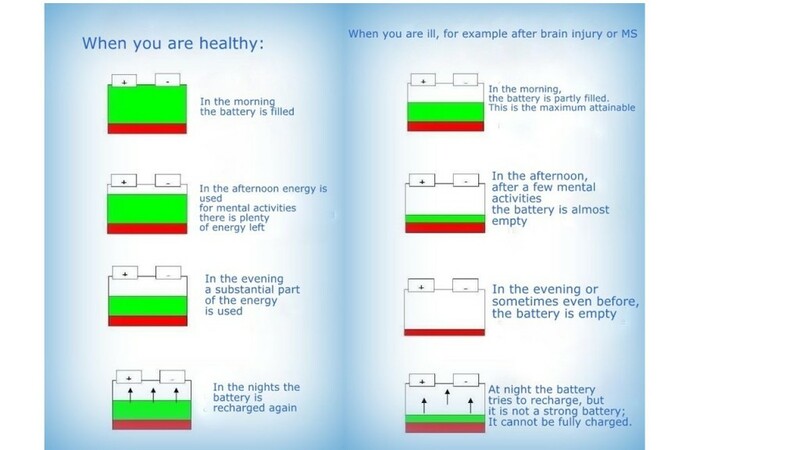 This battery image that is also on the article I linked above is the best explanation I’ve seen. It genuinely does not help that I am working with insomnia right now. But apparently this is normal. When I get tired, I make more mistakes. I use everything in the world to distract me from what I need to be doing instead of what I want to be doing. It’s also normal to have insomnia at the same time, which doesn’t seem fair to me at all, but. Who am I to say what I can & can’t get through? I never thought Moyamoya could be compared to having a traumatic brain injury, but the more articles I read? Yeah, it is. I’ve had strokes for crying out loud. They weren’t major [thank God], but they’re there. They’re the reason I have scar tissue on my brain. My head has been cut into to repair damage my own body is doing to itself. I’m trying like hell not to cry while I write this, because I know that on some level, a lot of my family, friends, & coworkers understand that this happens to me. But for those who don’t? It’s incredibly frustrating to deal. I don’t mean to snap at people. I don’t mean to forget things. I don’t mean to be so focused on staying awake that I can’t focus on anything else. I hate not having the energy to go grocery shopping when 15 minutes ago I was gung ho about it. I hate that my kids suffer because sometimes Mommy just can’t. And no in that anthem way of, “I can’t even” that seems to be running the internet & everyone around me lately. I actually, literally, can’t sometimes. I also can’t tell you how much I just want to be that super mom that everyone thinks I am. The super woman. The super wife. I’m none of those things. Because some days? Staying upright long enough to get the kids into bed so I can crawl into mine takes everything.